Follow along live as President Barack Obama gives his 2014 State of the Union speech from the U.S. Capitol in Washington, D.C., beginning at 9 p.m. 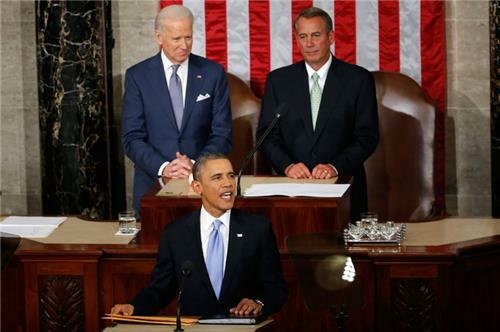 Welcome to U.S. News & World Report's live blog of President Barack Obama's State of the Union. So who gave the first 'State of the Union' speech? Hints: It's a trick question, and it wasn't George Washington. Get the answer and other SOTU trivia here. Inequality is going to be a major theme of the president's speech tonight, and by at least one measure, inequality in the U.S. is worse than ever. University of California, Berkeley economist Emmanuel Saez recently estimated that in 2012, the top 1 percent of earners took in 22.5 percent of all income, while the bottom 90 percent for the first time on record dipped below 50 percent, as Pew's Fact Tank blog has reported. Sgt. 1st Class Cory Remsburg will also sit with the first lady, along with his father, Craig. The Army Ranger was grievously wounded during his 10th deployment in an IED attack in Kandahar, Afghanistan, leaving him with brain damage and partially paralyzed. His bio on WhiteHouse.gov says he endures six hours of therapy per day, and has previously met the president three times. There have been few clear national security victories for the president this past year, experts point out, questioning whether Obama will mention any of them in great detail: Afghan President Hamid Karzai has not yet signed a post-2014 security agreement with the U.S.; Syrian negotiations remain gridlocked in Switzerland; and new nuclear sanctions against Iran are still up for debate in Congress. Obama touts the recent White House college affordability summit, where more than 150 college leaders, businesses and nonprofits made commitments to increase access and affordability for low-income students. "Opportunity is who we are. The defining project of our generation must be to restore that promise," the president says after pointing out that General Motors CEO Mary Barra, Speaker of the House John Boehner achieved great things from humble beginnings. 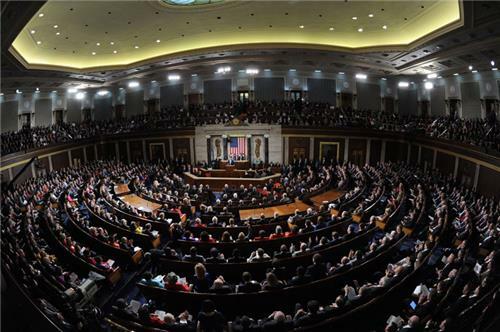 Crowd enthusiasm varies with different parts of an address each year, but everyone in the House chamber looks pumped about the feel-good statements about the auto industry and statements that business leaders have declared, "China is no longer the world's No. 1 place to invest. America is." Those corporate tax "loopholes" the president mentions are no joke; while the U.S. official combined corporate tax rate is 39.2 percent, the average effective tax rate is 12.6 percent, according to a 2013 GAO report. Obama: "My administration has launched two hubs for high-tech manufacturing...tonight, I'm announcing we’ll launch 6 more this year." Obama calls for new trade partnerships to support business. During the 2013 State of the Union, Obama announced the Transatlantic Trade and Investment Partnership between the U.S. and the European Union. "If extracted safely" may refer to methane-capture systems that are at times installed for extracting natural gas. Without them, methane emissions are high. Factoid: First mention of an "all-of-the-above" energy strategy in a State of the Union was in 2012. President also called for an end to oil subsidies in 2012. Note: Carbon dioxide emissions ticked up 2 percent last year. "Fix our broken immigration system" gets a standing ovation. "If we are serious about economic growth, it is time to heed the call of business leaders, labor leaders, faith leaders, and law enforcement – and fix our broken immigration system," the president says. Crowd reacts with standing ovation. "Let's get immigration reform done this year," Obama says. The GOP has its own plans for that, but faces a tough balancing act. Read more here from U.S. News' Lauren Fox. President Obama once again heralds the return of manufacturing. While the industry has posted strong growth in recent years, job growth has not kept pace, in part because many jobs have been automated. True, the industry has added 557,000 jobs over the last four years, but that comes after it lost 1.4 million in 2009. Right now, manufacturing has 12 million workers, 7.5 million fewer than at its peak in 1979. President Obama has asked Vice President Biden to lead a new initiative to reform training programs in America. "That means more on-the-job training, and more apprenticeships that set a young worker on an upward trajectory for life. It means connecting companies to community colleges that can help design training to fill their specific needs," he says. Obama on career and technical education: "It means connecting companies to community colleges that can help design training to fill their specific needs." Charles Wheelan lists three big things Obama should say. Has he hit any of them so far? Find out. Applause in the House chamber on Obama's call to re-authorize long-term unemployment insurance is overwhelmingly Democrats. Next up: education. "It's not enough to train today's workforce," Obama said. "We also have to prepare tomorrow's workforce, by guaranteeing every child access to a world-class education." We may get a call to action for early childhood education soon. Obama treads lightly when he comes to immigration. He urges Congress to act, but remains vague about what that policy should look like, leaving House Republicans the breathing room to craft and pass their own bill. Obama reasserts his support for a patent reform bill that would allow tech companies to spend less money on "needless" patent infringement lawsuits, which could be spent on research or device manufacturing. Patent trolls sometimes use a poorly defined or expired patent on consumer technology to extort an out-of-court settlement from small businesses using that gear. The House passed the bipartisan Innovation Act aimed at defending the patent rights of inventors in December. Senate Democrats may debate the bill’s “loser pays" model, which seeks to deter patent trolling by requiring the losers of a patent lawsuit to pay the winning party's legal fees, with certain exceptions. Ad lib: "It is right for America, we need to get this done." Re: Pre-K coalition. Obama again makes a call for investment in early childhood education. Last year, he asked for universal pre-K for all four-year-olds, and makes the same call tonight. He says the government will invest in a Race to the Top "for our youngest children." "And as Congress decides what it's going to do, I'm going to pull together a coalition of elected officials, business leaders, and philanthropists willing to help more kids access the high-quality pre-K they need," he said. Obama announces down payment of the Federal Communications Commission and companies including Verizon, Sprint, Microsoft and Apple to connect 15,000 schools in the next two years. Obama references the broad higher-education agenda he put forth in August, including incentives for colleges to keep prices low, and more opportunity for students to access income-driven student loan repayment options. "Today, women make up about half our workforce," the president points out. "But they still make 77 cents for every dollar a man earns. That is wrong, and in 2014, it’s an embarrassment. A woman deserves equal pay for equal work." "Women deserve equal pay for equal work," Obama says. Everyone on both sides of the aisle stands and applauds. "It is time to do away with workplace policies that belong in a 'Mad Men' episode," Obama adds. Obama's executive order to raise the minimum wage for some federal contract workers is garnering a lot of attention and an SOTU mention, but here's a look at exactly how big of a deal it is (or isn't). Sen. Lindsey Graham, R-S.C., says Obama's tone on immigration in the State of the Union was "perfect" with a "light touch" call to accomplish immigration reform this year. After the State of the Union, Republicans were angry and put off by Obama’s message that he would go it alone. 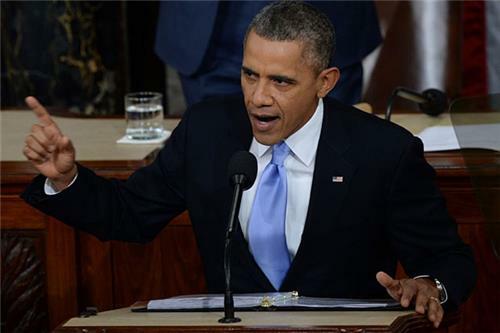 GOP accuses Obama of furthering partisan divide in State of the Union speech. Is Computer Coding the New Silver Bullet? Copyright 2016 © U.S. News & World Report LP.